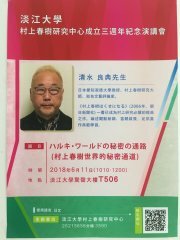 In commemoration of the 3rd anniversary of our establishment, CMSTKU is proud to announce that Mr. Yoshinori Shimizu has been invited to give a talk. CMSTKU hopes to attract more Murakami fans to join us in the coming years! Please use the link below to enroll.